Homeless advocates are rallying to keep the "Hope Village" homeless encampment up and operating, but the state owns the property and is evicting the people living there. Kris Sanchez reports. A group in San Jose said Monday it has found a solution to homelessness, setting up a new type of encampment just south of the airport. But it may not last long because they've been told by authorities to leave. Organizers of the "Hope Village" said the site at 1010 Ruff Drive, just south of Mineta San Jose International Airport, has been abandoned for five years. They've turned it into a clean encampment with good tents and no drugs or alcohol are allowed. Authorities, however, said they have to move. Some said they're staying anyway. The camp formed over the weekend, with seven homeless people moving in. "Nobody's stealing," camp resident Charles Nelson said. "It's just all around a better solution." A group in San Jose said Monday it has found a solution to homelessness, setting up a new type of encampment just south of the airport. There's just one problem: They've been told to disperse. Ian Cull reports. It's safe and clean with proper fencing, a toilet and a community area, Nelson said. The village is privately funded and could house up to 30 people. 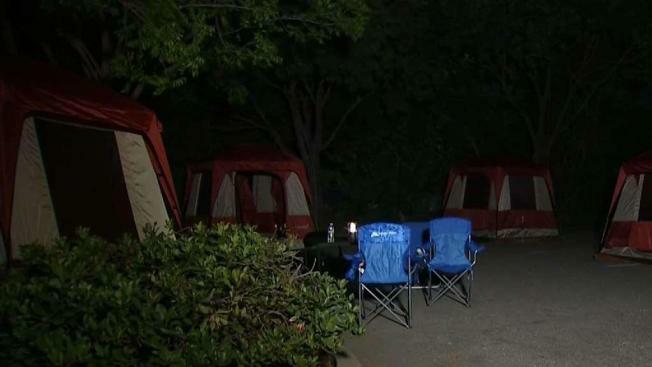 But on Monday morning, authorities gave the campers an eviction notice, saying they don't have permission to be there because it's on the property of a state employment office. Organizers pointed out that no one uses the lot and there's another encampment 10 feet away. "We don't see any alternative," camper Peter Miron-Conk said. "Somebody has got to press the city and county to do something about the thousands of people that are living in encampments in horrible conditions. And nothing's being done to change that." City Councilman Tam Nguyen believes city leadership such as himself should step up. "Actually, I admire them for taking action instead of talking and thinking and planning about it for so long," Nguyen said. For now, the councilman is asking state leaders if the village can stay. "So I thought, give it a chance. Give them time, and let's Work together on that, and that's what I'm hoping for," he said. The eviction means the campers need to move out by Thursday. But some said they won't. "I'm happy to sit here and have them arrest me," Miron-Conk said. "To make the point that somebody needs to do something more."